On February 2, 2014, the Seattle Seahawks defeated the Broncos 43–8 to win Super Bowl XXVII, with largest margin of victory for an underdog in Super Bowl history. 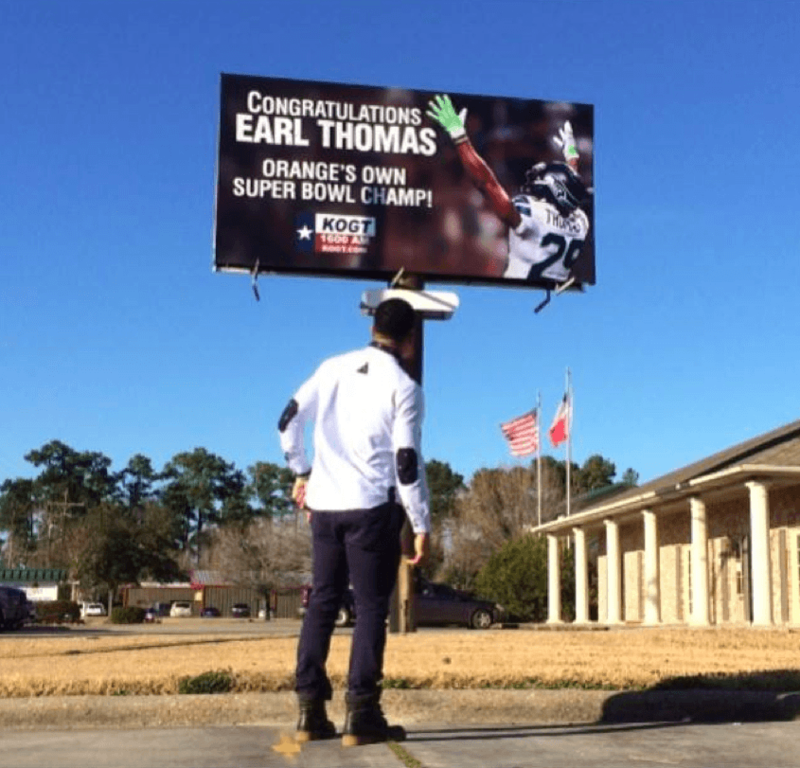 On the winning team that day was a man by the name of Earl Thomas, a graduate of West Orange Stark High School in Orange, Texas. Thomas was chosen by the Seattle Seahawks with the fourteenth overall pick in the 2010 NFL Draft, as a University of Texas sophomore. This past spring, Thomas signed for the next two years with Seattle and is set to make $17 million in base salary, per Over the Cap. I don’t care about Earl’s career or his contract. Maybe you do, and that’s okay. What I do care about is helping students across the nation, and especially from my home town of Orange, Texas, (that Earl and I share) find a career that is rewarding, meaningful, and possible, and professional football does not fit that bill. If you do make it to the NFL, the odds aren’t good for life afterwards, and that comes quickly! According the the NFL Players Association, the average career of an NFL player is 3.3 years. Last year, a study was released that found “more than 40 percent of retired National Football League players … had signs of traumatic brain injury,” according to a press release from the AAN. Learn more by reading an article by the Washington Post. Sports Illustrated estimated that 80% of retired NFL players go broke in their first three years out of the League. In an article by Forbes in response, lack of preparation for second career is cited as one of five reasons. …why put all of your eggs in one basket to go pro and forego a solid education? Because kids see what is most important on TV, in the news, and even on our billboards. After the Super Bowl win, there were signs and billboards all over town congratulating Earl as THE hometown hero. Many of the small shops along the main drag through town, used aged signage letters to honor him, in place of their normal witty quotes or sayings. Driving through town after the Super Bowl, I got the sense that the community believed Earl was the first person from Southeast Texas to do something important with their life, and I definitely felt lacking on my daily inspiration when the precious witty quote signage real estate was lost to the wrong kind of role model our students need. Now, I’m not arguing that Earl didn’t work hard and that his accomplishment (on a team) was not noteworthy. In fact as a high school student, I undoubtedly had more newspaper articles, and even my only TV news spotlight, from being a champion powerlifter, than for any of my other academic, leadership, or community endeavors. The point: what we emphasize, we value, and children pick up on that. What else is a student to think when schools build football stadiums in recent years that cost not a fortune, but MANY fortunes? While this insanity is going on, there are students that can’t take the pre-eningeering classes in high school because they can’t afford the mandatory fee that covers the expense of the 3D printers and programming equipment bought every few years to try to stay mildly current with technology. And we wonder why the number one career that kids aspire to is to be a pro-athlete? We are spotlighting the wrong super heroes, folks. And this is to the detriment of our communities, our nation and our world. Careers in science, technology, engineering and math (STEM) are in demand, high-wage, and contribute our health, happiness, and safety. STEM careers make a world of difference and help shape our future, yet we can’t prepare workers fast enough to meet the demand, because there are not enough students leaving high school with the skills they need to enter these pathways. Perhaps, if we praised diverse STEM professionals as our heroes on billboards, community signs, news, and media, we wouldn’t have such a problem. Students would see that STEM is cool, it is important, and it is for them. Women and people of color are significantly underrepresented in STEM fields, and thus girls, young women, and students of color need to see people who look like them who’ve gone into these careers. They need to learn that STEM != (that’s code for ‘does not equal’) Geek squad or the Big Bang Theory, but instead that STEM drives technology to make our world a better place, and that STEM is for creatively and collaboratively solving problems that matter. So, let’s put our money where our mouth is and invest in education, and invite the dawn a new era with the rise of a far superior super hero. Are you or do you know a STEM hero? I invite you to start a campaign in your hometown honoring the STEM Heroes from your community. When you do, share photos and results in the comment section below. So, let’s value education first, vote no on that next bond issue for a multi million dollar stadium, rent a billboard to highlight something useful, and finally, help children learn and see STEM, so that they have a fighting chance, and so that our world might, too. NPR | How Likely Is It, Really, That Your Athletic Kid Will Turn Pro?